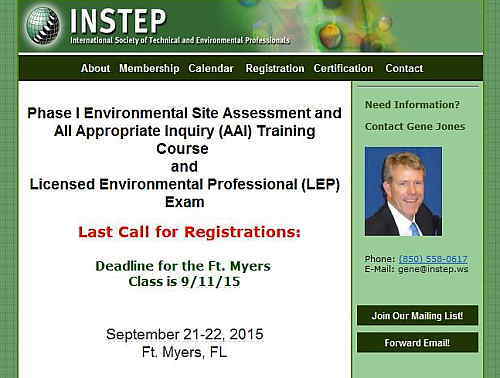 INSTEP has initiated this program to assure that professionals providing Environmental Site Assessments (ESAs) have the acceptable academic background and a minimal level of verifiable appropriate experience. In this program, elements of the ASTM Phase I ESA Standard E1527, federal standards and practices for All Appropriate Inquiries (AAI), ASTM Phase II ESA Standard E1903, as well as, ASTM’s E1528 (Standard Practice for Limited Environmental Due Diligence: Transaction Screen Process) will be presented. The focus of this training course is on these standards and other relevant national and Florida specific issues. 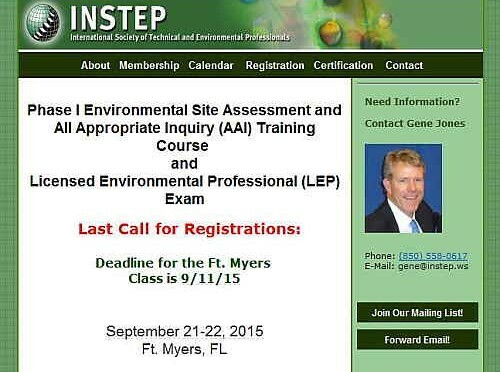 Upon completion and passage of the exam, each participant will receive a certificate stating that they are a Licensed Environmental Professional (LEP) certification from INSTEP. NOTE: The course is NOT an Exam Review or Exam Preparation Program and attendance of the Program is not required to sit for the Examination. Have the equivalent of ten (10) years of full-time relevant experience. For course and registration information, call Gene Jones at 850-558-0617.